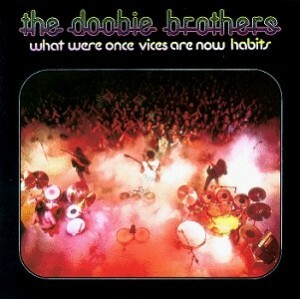 Today’s Cool album of the Day (#952 in the Series) is The Doobie Brothers, What Were Once Vices Are Now Habits. Can you believe that this little gem was released 41 years ago this week!! This was easily my favorite album of theirs. I always loved the overall sound of it. The breezy feel that it had, the use of harmonies and wooden instruments and yes, a trombone tossed in here and there. The Doobies were a long time favorite of mine, but mainly for albums like this. “Black Water” was a huge hit, yet it’s nowhere near my favorite track on the album. I love the way the album had a nice warm flow. I’ve said many times that in most cases my least favorite Doobie songs were their huge hits. If I near hear “China Grove” again.. well that’s fine with me. I’d much prefer to hear “Song to See You Though” or other gems off this album such as “Spirit,” “Eyes of Silver.” In fact, two of the bands best tracks of all time just might be “Tell Me What You Want and I’ll Give You What You Need” or “Another Park, Another Sunday” Ha, after reading some of those title I probably should have saved this for a summertime feature. It really is a warm weather album. Producer Ted Templeman had a unique idea of running the guitars through a leslie speaker. No maybe not as famously as when the Ernie Isley of the Isley Brothers did it on “Who’s that Lady,” but still rather unique. Vices peaked at #4 on the Billboard Top 200 Album chart. “Black Water” was a #1 hit, in fact it was the bands first #1 hit on the Billboard Hop 100 Single chart. “Another Park, Another Sunday” was the first single. “Eyes Of Silver” was the second. Radio began playing “Black Water” without a single and though word of mouth it reached all the way to #1. A few ending notes… Little Feat’s Billy Payne added keyboards on the album and Arlo Guthrie added autoharp, harmonica. One of my Faves”. A lot of good tunes, but one of my Faves, Another Park, Another Sunday.